Now that I have finished a Whole30 and, just last Saturday, a 50K, I need a new challenge. Last week I heard a story on RadioWest about minimalism and two guys who have, over the years, learned to live with less and they believe that they are happier because of it. This article explains their philosophy in better detail and after reading it, I was inspired to pair down what we own by playing a version of their minimalism game. 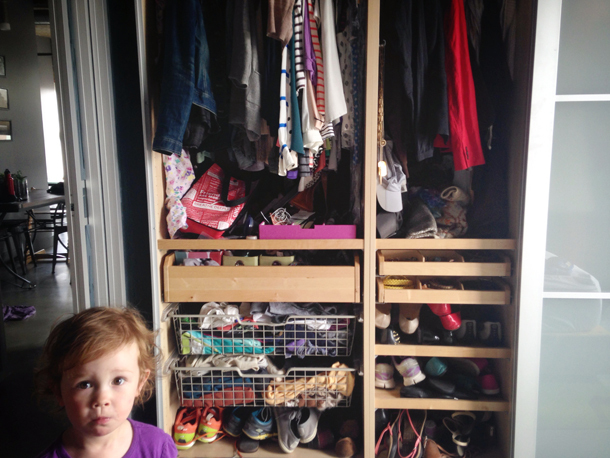 With our loft remodel almost entirely complete, we are now learning how to live in our smaller space. Lately I've found myself shoving things into places where they don't belong (namely my closet) and that clutter makes our rooms messy and my brain anxious. 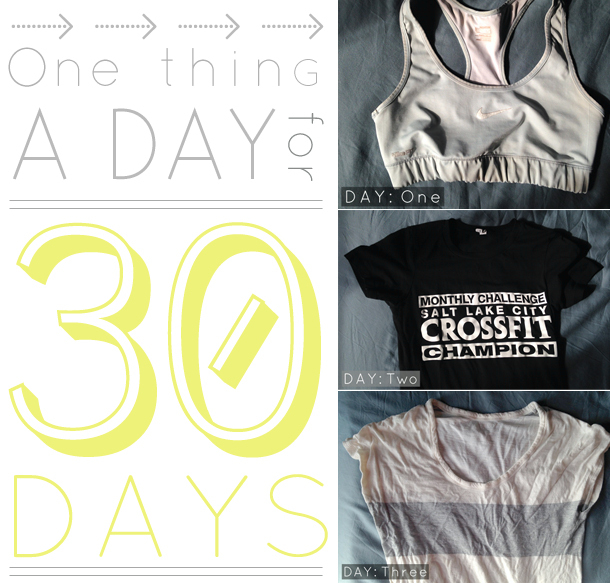 Day One - The sports bra that left me chafed after my 50K! I am not sad to see this thing go. Day Two - I won this for fastest time on the AirDyne. It doesn't fit well so I'll never wear it! Day Three - Stained. An example of why I shouldn't be allowed to wear white. 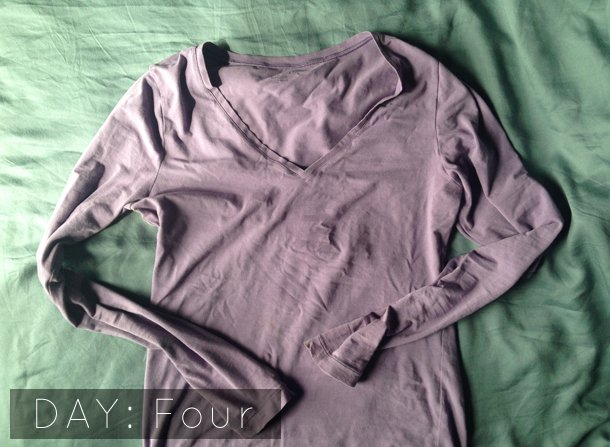 Day Four - Covered in grease stains. I promise not to bombard you with posts about minimalism and my get-rid-of's won't only be my clothes as I hope to dig into household items, Alice's stuff and maybe even Lee's stuff (just kidding, Lee). And maybe I'll get rid of a cat or two. Item number 4! // Alice's little head and my shamefully stuffed closet. They are coming to Raleigh in May to speak at a bookstore near us and I had already planned on going! I might do this challenge too! I love living with less. Alice's face! She's like "wait my stuff isn't next is it?!" I get a sick thrill, too, when getting rid of stuff!! And, more than once, after I've thrown something away I've been like.... "Damn it. I should've held onto blah, blah, blah." I will admit that one of my greatest worries about transitioning back into life in America is how BIG things are. I love looking at homes online, but they are all so huge! It's exciting, I hate my closet kitchen, but really, do I NEED all that space? No. I just am told I do through advertising, etc. Anyway, I like your idea. I love tossing things! In fact, like you and Caroline, it brings me great joy. My darling husband on the other hand finds sentimental value in just about anything and everything. Most of my de-cluttering happens when he's not home, otherwise, it's a huge struggle.